When creating a Quality Management System (QMS) using the requirements of ISO 9001:2015, you will find that corrective action is one of the key elements to a good QMS. In fact, this was so important that the previous version of ISO 9001 included corrective action as one of only six mandatory documented procedures. 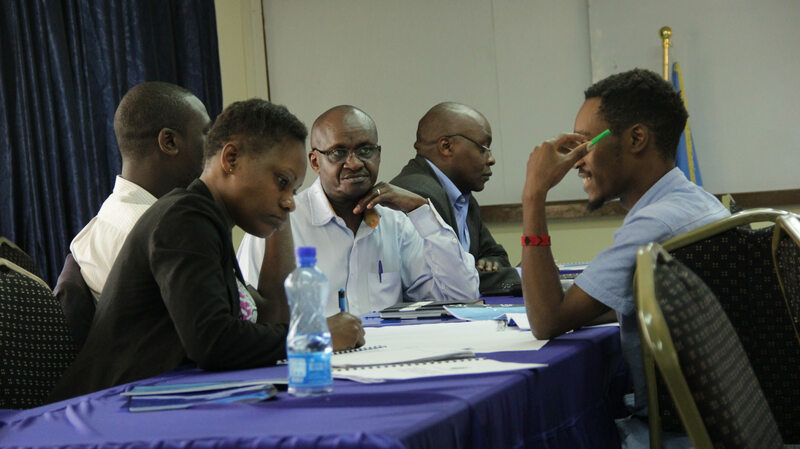 Considering how important this process is to the success of a good Quality Management System, RCMRD invited Top Quest consultants to educate staff on making corrective actions work to RCMRD's benefit. RCMRD holds ISO 9001:2015 accreditation. This was a one-day training at RCMRD attended by all staff with Ms. Stellah Otaro from Top Quest Consultants facilitating the discussions. She started the day saying, "If you have identified that a problem is more serious than one simple non-conformance, and you need to perform corrective action to prevent the problem from happening again, you will want to use a systematic process to ensure you do not miss anything – such as the Seven Steps for Corrective and Preventive Actions to support Continual Improvement. In a corrective action process, it is critical that you do not just try to fix the easy-to-see causes; instead, you need to look deeper into the cause of the problem to find the root cause so that you can correct this." She kicked off discussions by going defining what a root cause is, conformity, approaches to problems and analysis techniques to help solve these problems. These topics were designed to make sure that a. auditors in the room were given the needed skills to analyze auditee creative action and root cause for accuracy, relevancy and completeness for improving the auditees system and have a positive impact on the organization;b. The participants should be able to understand the root cause analysis and c. To give the participants an understanding of the steps used in identifying root cause if problems. Ms. Otaro touched on the cost of quality, the cost of non-conformities looking at organizational sources, internal parties source and customer source. She further stated that most problems are only looked at from one point of view thus eliminating any chances of full analysis of the problem which results in the reoccurrence of the same problem. 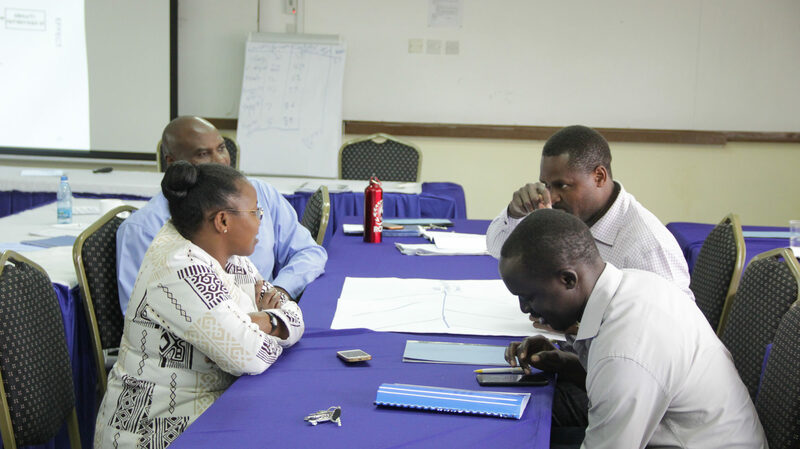 Staff were put in hypothetical situations, with Ms. Otaro dividing the trainees into three groups for the main purpose of evaluating how they understood the concepts as presented. To do this, she gave them two situational questions of which the three groups were to use the following elements to answer them: Source of requirement; Requirement; Source of finding and Finding. After the group work, the various groups concluded that some problems could be traced to external auditors, all reference materials should be in the library and if you want to identify a non-conformity, you should link it to a requirement. She told staff that, "Only when you find and correct the root cause of a problem will you truly ensure that the non-conformance does not happen again." 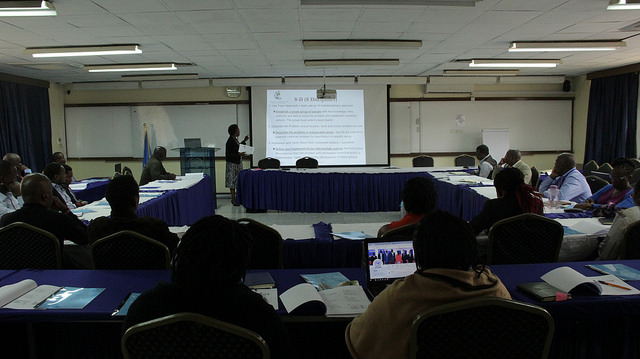 Ms. Otara advised that as an Organization, RCMRD should have a service charter. The third and final session was used to practically solve a problem using the pareto chart, fishbone analysis and the five 5 why analysis that asks the why question until you come up with a conclusion to the problems. 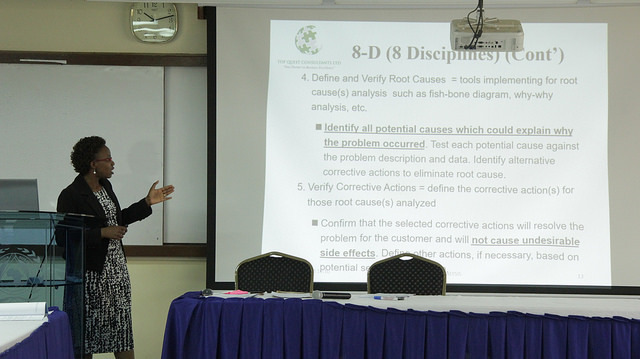 By performing exercises and group discussions, attendees developed a hands-on understanding that would facilitate the implementation of good corrective actions within the organization.The Root Cause Analysis and Corrective Action training course teaches valuable root cause analysis tools essential to problem solving, as well as the methodology to address corrective actions. The course provides a firm understanding of the process by which employees can find the underlying causes of problems that impact many organizations’ operations and profitability. The training ended the facilitator commending the staff for having been active throughout he day especially when discussing their problems in detail. The RCMRD Management and the Deputy MR noting that the material was presented in a way that didn't overwhelm - "which is difficult because there's so much material. The instructor made sure everyone was clear before moving on and encouraged group dialogue, discussion and questions which enhanced the class."